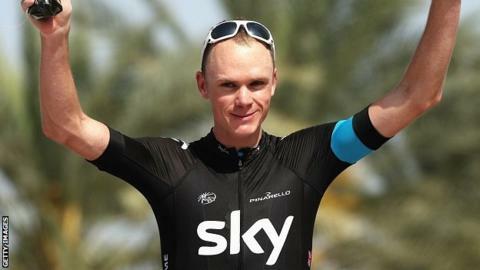 Froome, runner-up in last year's Tour de France and the 2011 Vuelta a Espana, grabbed the red jersey on Thursday before winning stage five on Friday. Saturday's 144km final stage was won by France's Nacer Bouhanni, who outsprinted Australia's Matthew Goss and American rider Taylor Phinney. "At the beginning of the week I was thinking top five was a decent objective," said Froome. "It's important that I win my first stage race, it's a good start to the season. And I won ahead of those who will be my rivals on the Tour." Australian Cadel Evans, who took third place overall ahead of Spain's Joaquim Rodriguez, winner of stage four said: "Third isn't bad. "It was a nice race with a good level of riders, I am feeling good and my condition is good." Froome's win was reminiscent of compatriot Bradley Wiggins's Paris-Nice victory in 2012, when the 32-year-old also claimed the Tour de Romandie, the Criterium du Dauphine and the Tour de France. Wiggins, who started his season in Oman in a supporting role, was never in contention after being classified last in the opening stage having been delayed by a crash. Team Sky sports director Nicolas Portal told the team's website: "It's great to finish this way in the first race of the year for this group. "To take the jersey and bring it home is always a good feeling. "Some of the sprinters' teams came through to help on the front and we controlled things. It was a short climb so we made sure Chris was in a good position. "The good thing about this race was that we achieved exactly what we wanted to do, which was to return to the Sky style of racing. "We controlled from the front and, when we commit to something, we really commit to it and carry it out together as a team. These are all the things we were doing last year."